PCCP is delighted to announce the high-profile themed issue on scanning tunneling microscopy. It is our pleasure to invite you to submit to this themed issue. The themed issue will be published in PCCP in summer 2013 and will be promoted to the community throughout the year to maximise the visibility of the work published. It has been 30 years since the invention of Scanning Tunnelling Microscopy (STM); allowing scientist to directly image the nano-world at atomic resolution and fuelling the development of a large family of probe-based microscopy. More importantly, STM has opened new avenues to explore the fascinating properties associated with the nano-sized objects, and has stimulated the growth of nanoscience and nanotechnology. As a powerful surface characterization technique, STM is particularly important for surface and interface physical chemistry research. The deadline for submissions to the themed issue is 22 February 2013, although submissions before this date are of course welcomed. Please do let us know if you are able to accept this invitation by contacting the PCCP Editorial Office. A PCCP paper which studies the vibrations of odorant molecules (or aroma compounds) and how these effect our sense of smell, has featured in Science Daily this week. The ‘HOT’ PCCP article specifically looks into the vibrationally assisted electron transfer mechanism of olfaction, and whether this process is what really allows us to distinguish between different smells. They found that olfactory receptors can pick up molecular vibrations to distinguish between odour molecules. Previously, scientists thought that a lock-and-key mechanism was operating between different olfactory receptors and molecules. But then, it was noted that people could smell the difference between deuterated and non-deuterated compounds, which have the same shape but different vibrational frequencies. This paper provides further support for a vibrationally-assisted mechanism for smell. Vibrationally assisted electron transfer mechanism of olfaction: myth or reality? Sign-up to receive the free PCCP e-alert to see this themed issue first next week! 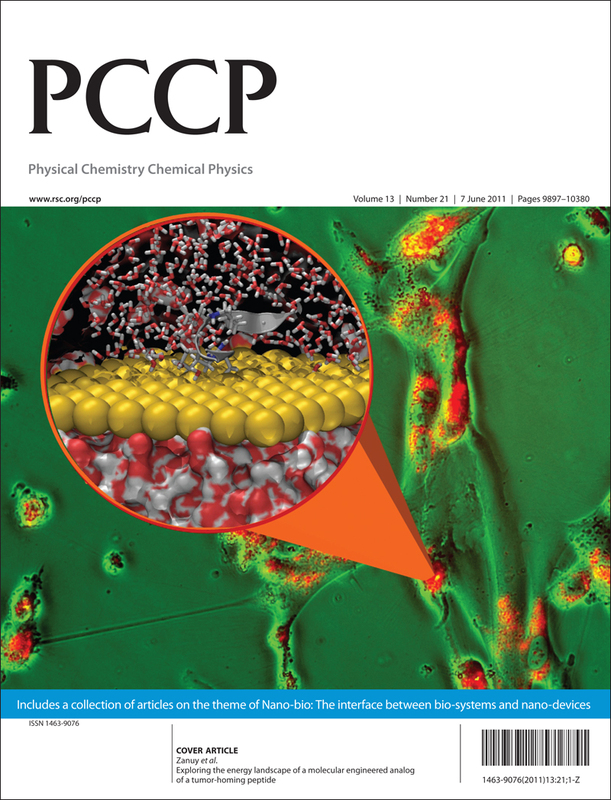 PCCP is a community-spanning journal which publishes the highest quality research in the broad fields of physical chemistry, chemical physics and biophysical chemistry. PCCP welcomes submissions in the areas of biophysics & biophysical chemistry. Submissions to PCCP should focus on the physical chemistry / chemical physics / modelling of the biomaterial in question; with future developments and forward-looking research especially welcome. Papers should be written in a style so that a non-biophysicist can have a good understanding of the work. Please note that classical biochemistry studies, standard or routine simulations, and specialist topics such as genetics, proteomics and bioinformatics are not suitable for publication in PCCP. We invite you to submit your latest high-quality biophysics & biophysical chemistry research to PCCP. 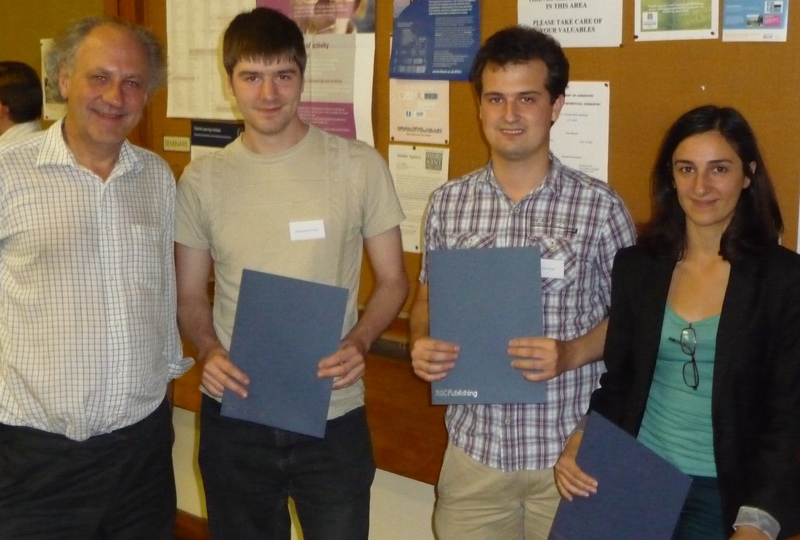 PCCP was delighted to award three ‘PCCP Poster Prizes’ at the National Training School in Theoretical Chemistry 2012 (UKTC2012) which was held at the University of Oxford this week. The winner was Jonathan Gledhill (Durham) with his poster on tuned range-separated hybrid functionals in DFT. The two runners-up were Martina Stella (Bristol) and William Vigor (Imperial College London) for their posters on a novel DFT embedding scheme and Full Configuration Interaction Quantum Monte Carlo (FCIQMC), respectively. Each student received a PCCP Prize certificate, presented by Professor David Logan, School Chair, as well as a financial award from the journal. PCCP will be awarding more Poster Prizes next year, so please do let us know of any suitable conferences which PCCP could sponsor in 2012. We also encourage you to submit your latest research to PCCP today! Water under tension in a Berthelot tube has been studied by high-speed photography and neutron diffraction. The water was cooled below the normal ice-nucleation temperature and was in a doubly-metastable state prior to a collapse of the liquid state. The observed pattern does not exhibit the usual crystalline pattern of hexagonal ice [Ih] that is formed under ambient conditions, but indicates the presence of other ice forms. The composite features can be attributed to a mixture of amorphous ice, ice-Ih/Ic and the high-pressure form, ice-III, and the diffraction pattern continues to evolve over a time period of about an hour. PCCP is delighted to announce the high-profile themed issue on Spectroscopy and dynamics of medium-sized molecules and clusters: Theory, experiment and applications. It is our pleasure to invite you to submit to this themed issue. This themed issue will tackle new and still unresolved challenges in molecular science with particular emphasis on experimental and theoretical spectroscopy and/or quantum dynamics. One of the principal topics is the treatment of anharmonicity in medium-sized molecules and clusters. Applications include, for instance, accurate description of highly excited states of molecules (including electronic, vibrational and rotational excitation), weakly bound aggregated systems, dynamics of molecules undergoing conformational changes, dynamics of molecules adsorbed on nanostructures, molecules at cold and ultracold temperatures, molecules in unusual environments (e.g., interstellar space), atmospheric molecules and long-range particle transfers. It is envisaged that articles in the themed issue will discuss different approaches to overcome the difficulties associated with the numerical treatment of anharmonicity in complex molecular systems. In addition, there will be articles exploring new experimental techniques devoted for the investigation of such systems beyond the harmonic approximation and beyond the Franck-Condon principle. The proposal of new strategies and the combination of existing approaches which deal with the analysis and interpretation of recent experimental studies of highly excited molecular systems and astrophysical observations are welcomed. We hope you can take part in this exciting issue. PCCP is pleased to announce a high profile online themed collection on Interfacial Phenomena in (De)hydrogenation Reactions. It is our pleasure to invite you to submit to this themed collection. All accepted papers will be published both online and in print and featured as part of a themed collection on the PCCP website, highlighting work from this fast-developing field to the community. In recent years numerous exciting developments on catalytic (de)hydrogenation have emerged specifically aimed at understanding the nature of active sites of heterogeneous catalysts and at rational design of novel catalytic materials. The intent of the special themed collection is to highlight recent advances in catalytic (de)hydrogenation reactions on solid surfaces. A particular emphasis is placed on the understanding of the interfacial phenomena of adsorbents with well established solid surfaces with the help of advanced characterization tools and theoretical modeling. Physical Chemistry Chemical Physics (PCCP) is delighted to announce a forthcoming high-profile themed issue on “Theory meets Spectroscopy”, with Guest Editors Manfred M. Kappes and Willem M. Klopper, Karlsruhe Institute of Technology (KIT). This will be the official themed issue of the international Bunsentagung 2013 meeting on the same theme organised by the Deutsche Bunsen-Gesellschaft (DBG) which takes place in May 2013, Karlsruhe, Germany. Free copies of the themed issue will be available at the meeting, maximising the visibility and profile of all published papers. We invite you to submit a high quality manuscript of original, unpublished research with a focus on quantum chemical methodology for spectroscopy or on the interplay between theory and experiment in spectroscopic studies in the gas or condensed phase. All submissions will be subject to rigorous peer review to meet the high standards of PCCP. When you submit your article, please indicate that it is for the themed issue. The invited speakers at the meeting include Mike Ashfold (Bristol), Tobias Brixner (Würzburg), Dominik Marx (Bochum), Frank Neese (Mülheim) and Martin Wolf (Berlin). For further speakers and details about the meeting visit the website. We hope you will be able to contribute to this exciting issue. This ‘HOT’ paper just published in PCCP results from a large international collaboration across 14 different institutes, and resulted from the 3rd International Summit on Organic Photovoltaic Stability (ISOS-3). The paper is a systematic TOF-SIMS study of the degradation behavior of six different organic photovoltaic (OPV) devices degraded under three different experimental conditions. This study highlights the advantage of combining analysis techniques to systematically assess OPV devices. The results of this investigation and previous reports shed new light on OPV stability and is a step towards the large scale application of organic solar cells. Frederik C. Krebs, Kion Norrman, et al.